The Epson Stylus Colour 777i is a colour single-function inkjet printer that is suitable for personal use and a home office with low-volume printing demands. The Epson Stylus Colour 777i printer is identical to the Epson Stylus Colour 777 printer, except for the colour and printer lid. The printer uses a black and a multicolour cartridge. Epson has optimised this unit for desktop colour printing, and its 4-colour drop-on-demand Micro Piezo inkjet technology produces superb-quality output on a variety of media types, including plain paper, photo paper, card stock, transparencies, labels and envelopes. The unit weighs 4.1kg and measures 450 x 546 x 279mm. The printer features a top-entry sheet feeder with a capacity of 100 sheets or 10 envelopes. The Epson Stylus Colour 777i also has USB connectivity and an input buffer of 256KB of RAM. The printer’s maximum monthly duty cycle is 5,000 pages. This printer is designed for printing family colour photos, letters, webpages, home business documents and personalised greeting cards. The print speed is 8 pages per minute for monochrome documents and 6 pages per minute for colour documents. The print speed for a photo ranges from 86 seconds to 248 seconds depending on the size and type of the photo paper. The maximum print resolution is 2880 x 720 dpi. The printer supports Microsoft Windows and Apple Mac OS operating systems. 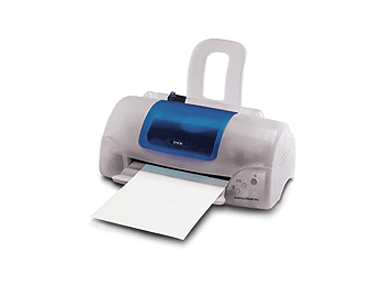 The printer’s small footprint makes it suitable for placing and using on a desktop. The printer does not have scanning or copying abilities, which would require you to purchase an additional device if you need those functions on a regular basis. The printer does not have Wi-Fi connection capability and only has a maximum paper input capacity of 100 sheets. This printer is designed for home use, and offices with medium-to-high print volumes would not find this printer to be suitable for their needs.